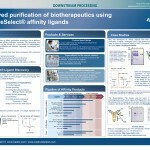 BAC BV – The Affinity Experts – develops novel & cost-effective solutions for affinity purification challenges. Affinity chromatography is one of the simplest and most effective methods for purifying protein therapeutics, offering reduced process steps and higher yields than non-affinity methods can provide. For standard MAb purification Protein A is a well established affinity ligand which clearly has demonstrated the benefits of a highly selective primary capture step. However, for non antibody based therapeutics and novel antibody formats lacking a regular protein A binding site, it becomes a challenge to find a protein A equivalent. The CaptureSelect technology addresses these challenges. Being derived from camelid single domain antibodies it enables tuning of any desired specificity thereby covering the whole spectrum of biotherapeutics. The CaptureSelect media provide a “plug-and-play” platform approach by introducing a generic capture step for the primary recovery of virtually any biological product, showing excellent contaminant clearance and enabling elution conditions that preserve product structure and activity. We will present these features and elaborate on how it can contribute in making the connection between increasing demands on product variety, timely supply and quality on one hand and the biopharmaceutical industry facing these challenges.